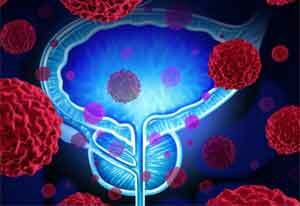 A group of Indian scientists has identified a sensitive and specific diagnostic marker for prostate cancer that may differentiate between cancerous and non-cancerous prostate enlargement. Prostate cancer is the second most frequently diagnosed cancer in men worldwide. The commonly used diagnostic test is to check the level of Prostate-Specific Antigen, PSA, in serum. Though itis a reliable marker it is not confined to prostate cancer only. PSA levels increase in benign prostatic hyperplasia as well which is a non-cancerous increase in the size of the prostate gland. A team of researchers from King George’s Medical University, Centre of Biomedical Research, Lucknow University, and Sanjay Gandhi Post Graduate Institute of Medical Sciences, Lucknow have evaluated the usefulness of Macrophage Inhibitory Cytokine-1 (Mic-1)protein in the diagnosis of prostate cancer.Dr. Ashish Gupta and his team have identified a potential biomarker for prostate cancer. Researchers propose that MIC-1 is better in terms of specificity than the commonly used Prostate-Specific Antigen. They evaluated the levels of MIC-1 in prostate cancer and benign prostate enlargement patients as well as healthy persons. Each group had about 80 persons.It was found that MIC-1 levels were significantly different in prostate cancer patients as compared to those with benign growth or healthy individuals. MIC-1 levels in the serum correlated with the grade of cancer. Higher levels of advanced cancers as compared to low-grade cancer. The study results have been published in journal Scientific Reports. Although further validation needs to be done on larger datasets, scientists believe MIC-1 could be a potential marker that might be routinely used in the laboratory for prostate cancer diagnosis with or without PSA. With further analyses, MIC-1 screening might be clinically useful in distinguishing between grades of prostate cancer too. “Detection of prostate enlargement, which may or may not lead to prostate cancer, is largely based on serum PSA levels. But PSA level is not definitive marker and could sometimes be misleading. Therefore, additional and more definitive markers are still under investigation. The finding that MIC-1 is consistently overexpressed in prostate cancer patients could serve as a valuable marker, additional to serum PSA, and a correlation between the two could in future act as a valuable diagnostic tool,” commented Prof. Urmi Chatterji of Cancer Research Laboratory at University of Calcutta, who was not connected with the study. The research included Navneeta Bansal, Deepak Kumar, Ashish Gupta, Deepak Chandra, Satya NarainSankhwar and Anil Mandhani. The study was funded by DBT, UGC, and CSIR.